Arrested in June 2005 in the largest casino in Spain, Casino Gran Madrid, were a couple of Chinese nationals who were caught red handed with 40 forged gaming chips of 250 Euro, value totalling 10,000 Euros, while attempting to play them on the simple chances on roulette. Police said at the time that they may have been part of a much larger organisation. Not long after this in December of the same year one of the largest casino groups in Northern Europe discovered in their stocks forged 500 Euro chips, one thousand seven hundred and seventy six chips were initially found. The perpetrators of this elaborate scheme to swindle hundreds of thousands of Euros were very ambitious in their plan because the exact number of forged chips may never be known. Taken into custody were a band of Orientals male and female of Chinese origin, soon after chips began appearing all over the city in rubbish bins and other dumping sites. Over 4,000 chips were discovered in two separate locations. Obviously the larger the casino is the easier it is for the perpetrators to pass off these forgeries. Some casino groups even use the same chips throughout all of the units in their group, this makes it much harder to control the amount of chips which are in stock. So instead of daily inventories being performed, inventories are undertaken on a monthly basis. The forging of casino chips is an age old problem but in recent years the scammers have become much more sophisticated, forging not only chips but playing cards and dice. In the Philippines, South Korea and especially in China factories exist for cloning and copying all sorts of gaming equipment but scammers obviously believe there is much more profit in the manufacture of gaming chips. In November 2007 South Korean law enforcers hit the jackpot when they uncovered a crime ring selling marked playing cards. Three men were arrested for making and selling the cards which can be read with specially designed contact lenses. The three allegedly manufactured and sold 26,400 sets of the cards over the previous year and exported their technology to China for handsome sums. Their product was so popular that a set of 12 packs of the marked cards sold for as much as one million won and drew an order from the US. The suspects are also accused of smuggling 2,000 pairs of specially designed contact lenses from China, with which their marked cards can be read. The backs of the cards were marked with patterns and figures printed in special fluorescent pigment. These can be read with the special lenses to show what kind of hand another player is holding. The Chinese web site www.casino999.com (now closed down) openly advertise all manner of corrupt gaming equipment. In June 2005 a group of four Chinese men were arrested for covertly photographing the playing cards on a mini baccarat table in an Australian casino, with the purpose of forging the playing cards and reintroducing them into the game at a later date, through the method of hand mucking. The mini camera was concealed in a packet of slim-line cigarettes. However in the last decade with the expansion of casinos worldwide and the conversion of many countries in Europe into the Euro currency, huge profits have been realised by gaming chip and card manufactures. This has enabled these chip and card companies to invest in new technology in order to combat the forgers. Certain card manufacturers are now offering playing cards with the casinos own logo designed in infra red on the face of the card and electronic baccarat shoes can be purchased. These shoes have the capability to read the cards as they are drawn from the shoe and correct dealer errors before they are about to be made. These security baccarat shoes work with an optical reader that identifies all the cards drawn, this optical reader reads a bar code on the surface of the cards. The Security Baccarat Shoe has the Baccarat rules set in the firmware so after identifying the cards as they are drawn it determines who the winner is: Player, Banker or Tie. This is immediately displayed on the digital table display unit. 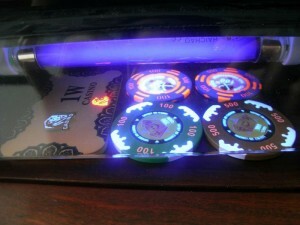 The software includes the possibility to adjust the game to the way each casino plays. It can be adjusted to the way to deal with burn cards (auto-burn, static burn, manual), how to manage overdrawn cards or if you want to play face up or face down. If there is an incident occurring an alarm will go off. The main benefit of these security baccarat shoes is the security that it brings to the game, as it minimises enormously dealing errors and cheating. It prevents card mucking and card swapping or rogue cards being introduced into the game. It also prevents the possibility of drawing 2 cards at the same time. At the time of writing 750 of the smart shoes are employed throughout various casino Baccarat tables in Macau. Chip manufacturing companies have been hard at work to bring efficient and cost-effective RFID (Radio Frequency Identity) solutions to the table games industry. Devices incorporated onto gaming tables to fight counterfeiting and fraudulent chips being introduced at the very first point of entry in the casino, the tables and at all points of exchange. 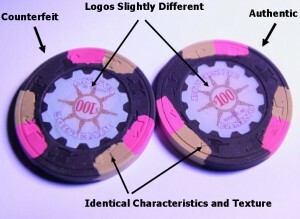 RFID chip security technology includes RFID embedded casino currency (gaming chips, and plaques), hardware and software that allows the operator the flexibility to track and verify gaming chip authenticity for its casino almost instantly, which can eliminate the possibility of counterfeit chips or errors in chip counts. RFID technology allows casinos the ability to track individual chips throughout the gaming floor and with special readers and software, follow payments, fills and credits, table drops, tips, win and losses per table at any time of the day. This almost eliminates the possibility of theft and any counterfeiting attempts. In late December 2008 the Argosy Casino in Kansas City Missouri U.S. during an investigation of the total chip stock, discovered one thousand one hundred , $100 fake chips during a monthly inventory. Just how this many chips remained undetected is a mystery. It seems that a cashier discovered the chips while attempting to put them into racks, she noticed that the thickness of the chips were too great. A 36 year old man was later taken into custody but until now there is no news of him being charged. The man is under investigation, accused of making hundreds of fake $100 chips, then cashing them in for more than $100,000.The general manager of the casino said that the counterfeit chips were of such a good quality they were difficult to spot. Even more recently just in April of 2009 the Crown Casino Melbourne realised through a routine check that they had an excess of 36 one thousand dollar chips. A gaming floor worker raised the alarm as she handled one of the chips in a high security count room, in a casino that size it may be easier to pass forged chips without them being noticed. This called for a complete inventory of more than thirteen million seven hundred thousand dollars worth of chips, eventually leading to the discovery in all of forty-two thousand dollars worth of forged chips. A recall and a complete new and improved set of one thousand dollar chips have since been issued. It has not been announced how or when the fake chips were brought into the casino and it is not known how long the chips have been in circulation on the gaming floor. Police are investigating and casino surveillance crews are reviewing hours of gaming table video recordings in a bid to discover the counterfeiting masterminds. No prizes will be awarded for guessing the nationality of the criminals involved. British Gaming Board Certificated Casino Manager with wide experience of Casino startup, expert in cheat detection and prevention with excellent facial recognition skills. Ability to remember names and faces of undesirables or high rollers over long periods of time. . Assisted Security & Surveillance departments in eight casinos throughout Switzerland during the opening phases of those establishments. Consultancy contracts for Casinos Austria, Holland Casinos and Novomatic Admiral. . Previously a founder member of I.A.C.S. International Association of Casino Security & Surveillance since 1994 with 12 years of contribution, worldwide membership incorporating some of the World’s major casino organizations. . Managing Director of the Casino Surveillance & Security Society, with world wide membership, to join click on the following link or copy & paste it into your browser’s address bar. :- http://groups.google.com/group/casino-security . Connecting the World of Casino-Security. . Author of many articles on the subject of casino security.